A long, long time ago when I was in high school, my friends and I decided that our contribution to our school’s Earth Day event was to break out my parent’s camcorder and record a music video of ourselves singing a take on that old ditty “There’s a Hole in the Bucket.” We thought we were so clever by changing the song to “There’s a Hole in the Ozone” and altering the lyrics to include the few global warming facts that we knew. (At this time, I’d like you to take a minute and let that sink in. Really imagine a group of high school kids making a music video of a parody of “There’s a Hole in the Bucket.” Yeah. It was that bad. And no, you can’t watch it!). These days, rather that writing lyrics, I’m working with Earth Day Fresno to plan this year’s celebration. 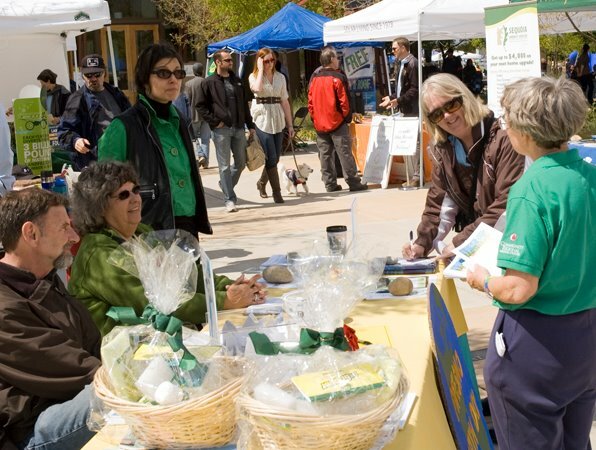 Established several years ago in conjunction with the Unitarian Universalist Church, Earth Day Fresno has been a successful event, drawing 2,000 people in 2012. This year, in an effort to draw a bigger crowd, we are moving the event downtown! You’ll be amazed at how many green/sustainable organizations and companies are here in Fresno. See them in action at Earth Day Fresno! Spearheaded by environmental activist Connie Young, this event is bringing together leaders in the green movement, local corporations, schools and everyday Fresnans interested in learning more about protecting our precious natural resources. The day will feature the latest in solar cooking, urban farming, healthy food, clean cars and recycling in an effort to educate the public on ways they can incorporate green choices into their daily lives. There will also be a full day of entertainment, music and children’s activities. The Bookmobile will be on hand and filled with books about environmentalism, green living, climate change and plenty of resources for the earth-minded. Fresno’s 2012 Earth Day event brought together businesses, entertainers, activists and families. The Earth Day Fresno Steering Committee, a group of thoughtful, energetic and committed individuals, meets regularly to ensure that we balance making this a great event while still preserving the environment. Every participant must comply with the Green Guidelines which focus on minimizing the environmental impact of the event. They do this through the use of recycled/upcycled materials, procurement of local food and products, minimizing or avoiding handouts, and focusing on alternative energy and transportation. 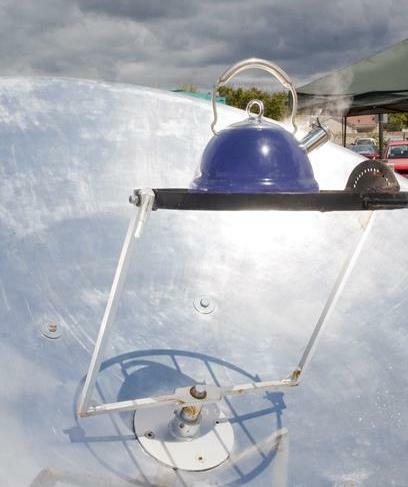 Solar Cooking is SO cool! A lot of hard work has gone into making this an incredible event so be sure to come downtown and see for yourself. Despite my best lyrical efforts, there’s still a hole in the ozone, but I’m really proud to know that groups like Earth Day Fresno exist to make sure that we’re all doing our best to protect our earth! 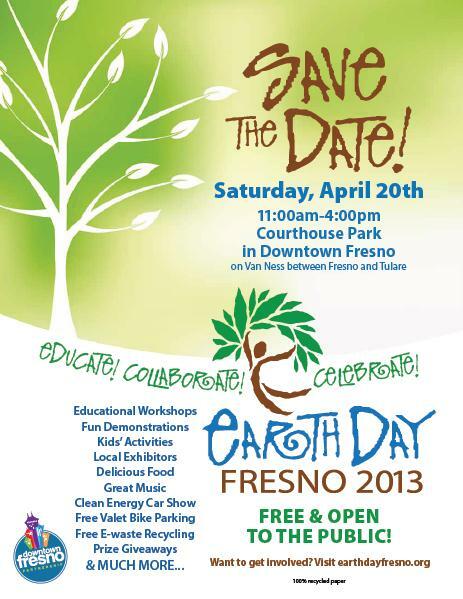 Earth Day Fresno will take place Saturday, April 20 from 11am-4pm at Courthouse Park in the center of downtown. Parking is available onstreet and in lots near the venue. Anyone interested in learning more about Earth Day Fresno can visit the website at www.earthdayfresno.org. 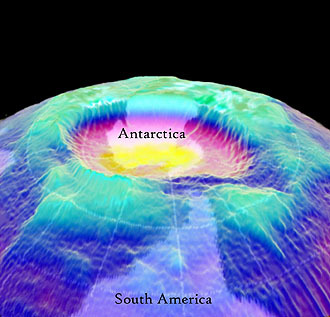 Established in 1970 as an environmental “teach in” with 20 million Americans participating, Earth Day is now celebrated in over 190 countries throughout the world.